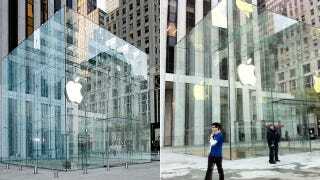 Here's what the newly renovated Glass Cube Apple Store on Fifth Ave in New York City looks like now. It uses only 15 panes of glass to create the cube (compared to 90 panes previously) and is held "seamlessly" together without any visible hardware. CAN YOU TELL THE DIFFERENCE. Of course you can! Well, maybe. When the two stores are side by side, it's sort of easy? Maybe not. Okay, it kind of looks the same. Whatever. The new design isn't sullied by metal fasteners nor are there as many breaks in the glass. Seamless! Amazeballs!